Habit: Annual to perennial herb (shrub); hairs 0 or simple. Leaf: basal rosetted or not, petioled, entire, dentate, to 1--3-pinnately lobed; cauline short-petioled to sessile, base occasionally lobed to clasping. Inflorescence: elongated or congested. Flower: sepals erect or spreading, oblong to ovate, base not sac-like; petals linear to obovate, white or yellow (pink or purple), occasionally reduced or 0; stamens 2, 4, or 6. Fruit: silicle, generally dehiscent, oblong to ovate, obcordate, or round (spectacle-shaped), flat perpendicular to septum (inflated), unsegmented. Seed: 2(4), gelatinous when wet; wing narrow or 0. Habit: Annual, glabrous or puberulent. Stem: erect to decumbent, several from base, 0.4--1.5(2) dm, branched. Leaf: basal not rosetted, early-deciduous, 1.5--5 cm, entire or pinnately lobed, lobes 2--5 pairs, 0.5--2 mm wide, linear; mid-cauline 1--3 mm, linear, base tapered, not lobed. Inflorescence: elongated; rachis glabrous or puberulent, hairs straight. Flower: sepals 0.6--0.8 mm; petals 0; stamens 4. Fruit: 2.4--3.6 mm, 1.8--2.5 mm wide, ovate, flat, tip winged, notch V-shaped, 0.3--0.8 mm; valves glabrous, net-veined; style 0--0.1 mm, included in notch; pedicel spreading to descending, 2--4(6) mm, cylindric or +- flattened, glabrous or puberulent adaxially. Seed: 1.4--1.8 mm, oblong. 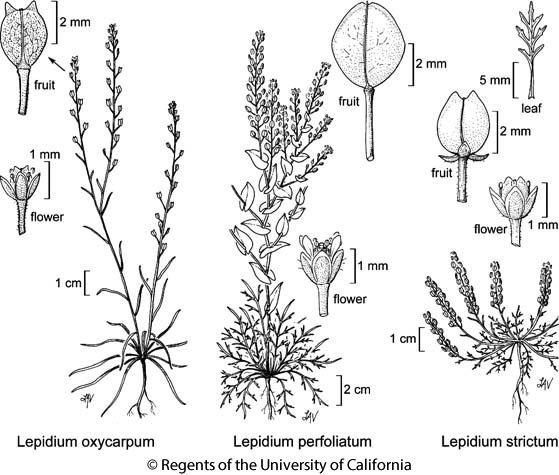 Citation for this treatment: Ihsan A. Al-Shehbaz 2012, Lepidium oxycarpum, in Jepson Flora Project (eds.) Jepson eFlora, http://ucjeps.berkeley.edu/eflora/eflora_display.php?tid=30553, accessed on April 25, 2019. GV, CW. Markers link to CCH specimen records. Yellow markers indicate records that may provide evidence for eFlora range revision or may have georeferencing or identification issues. Purple markers indicate specimens collected from a garden, greenhouse, or other non-wild location.